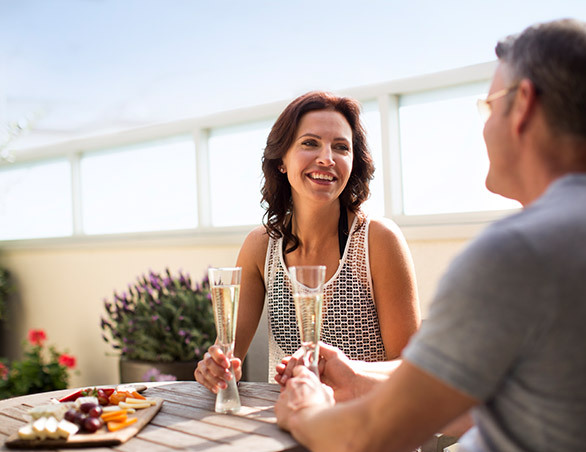 Conjuring up images of luxury and romance, the 700 sq ft Spa Terrace Suite is an ideal hideaway for couples. 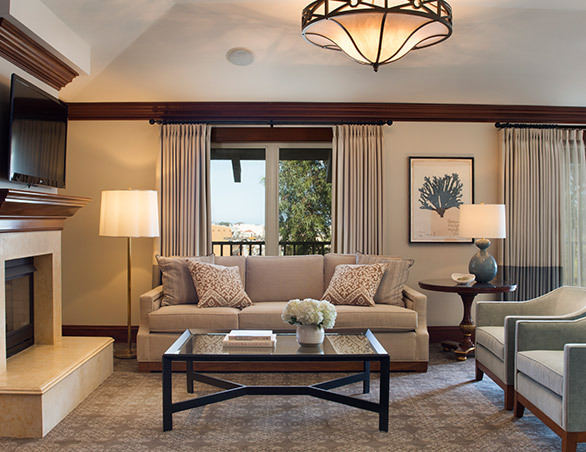 This elegant, airy suite comes with a cozy fireplace, wet bar and a whirlpool tub on the private outdoor deck. A spacious designer bathroom features a marble soaking tub and private shower. Highlights include state-of-the-art entertainment system and HDTV flat screen television with 24 hour movie system. 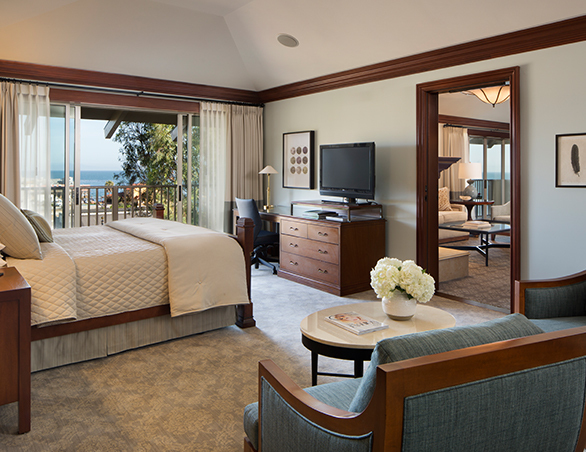 Note: This Monterey Bay suite does not have an ocean view. 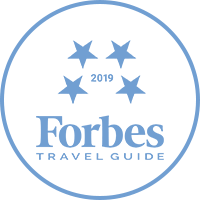 With an array of features and amenities, our Executive Suites are wonderful for family getaways or small corporate retreats. The spacious living rooms are ideal for relaxing and entertaining, while separate bedrooms have sliding glass doors with exterior balconies. 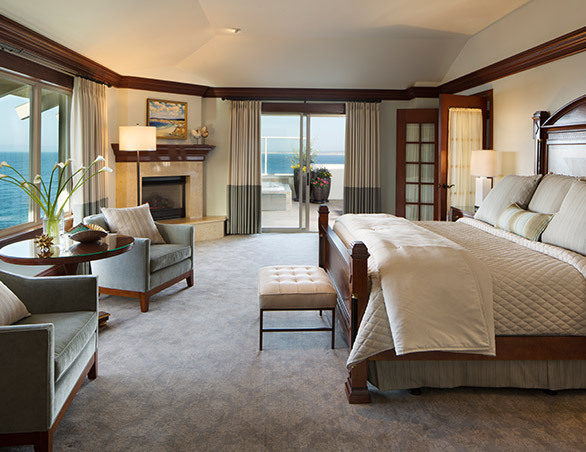 Guests can opt for the 900 sq ft one-bedroom Monterey Bay suites, or the more spacious 1,300 sq ft two-bedroom suites. With a palette of sophisticated offerings that lend a home away from home feel, the 1,500 sq ft Cannery Row Suite is a favorite for families on holiday, or couples escaping for a romantic getaway. The spacious living room offers a cozy fireplace, pull-down king Murphy bed, a full bathroom as well as a wet bar. 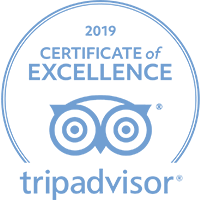 Both the living room and bedroom of this luxury hotel room suite feature balconies with views of historic Cannery Row and the ocean. This classic, opulent bedroom has its own fireplace, spacious bathroom with a marble soaking tub, separate shower and double sink vanity. 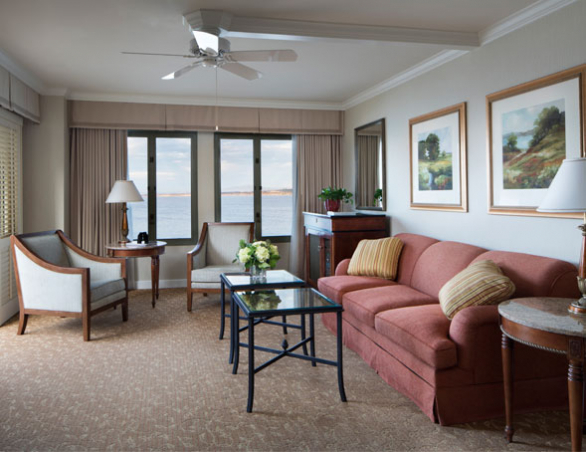 The Cannery Row Suite is ADA accessible. 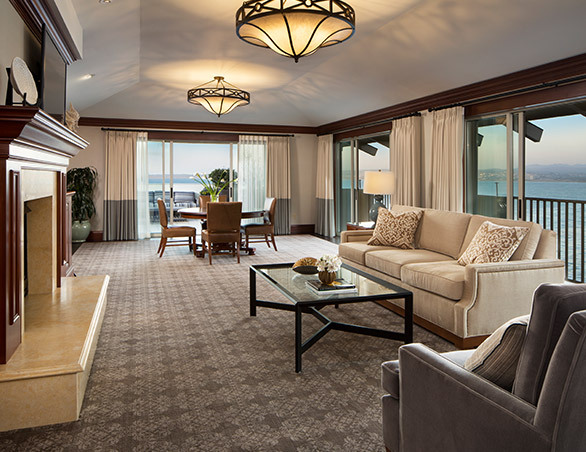 The 1,700 sq ft Grand Bay Suite engages guests in a multitude of ways. 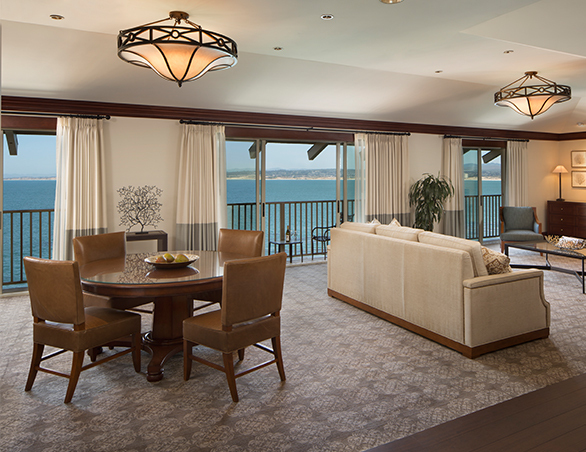 To start with, this suite boasts beautiful views of Monterey Bay from three separate balconies, all with sliding glass doors. The luxurious living room is designed for entertaining with a fireplace, a dining room table that seats 12, a wet bar with pantry and half bathroom. Highlights include HDTV flat screen TV with 24-hour movies and state-of-the-art entertainment center. 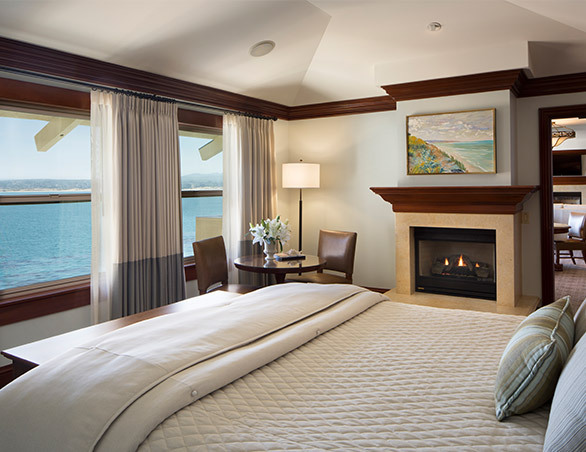 This Monterey Bay suite has a private bedroom complete with its own fireplace. 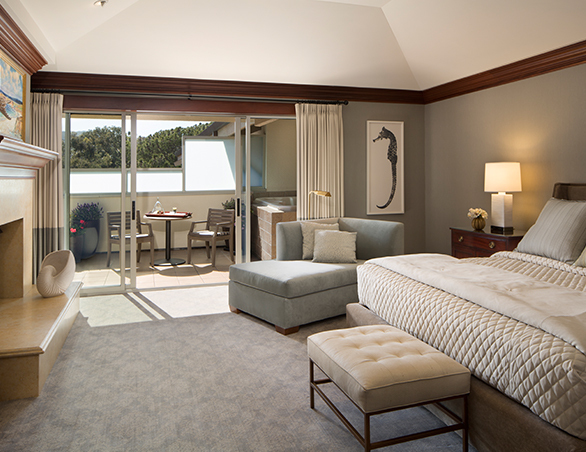 The suite features an oversized bathroom with double sink vanity, soaking tub, separate shower, and of course, a gorgeous outlook of Monterey Bay. 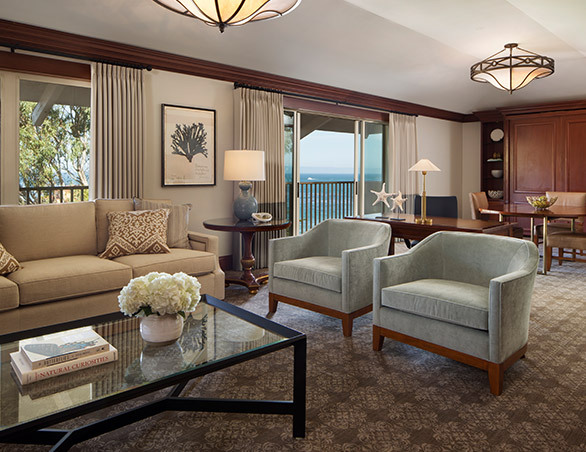 Luxurious and elegant, the 2,100 sq ft Presidential Suite delivers unrivaled offerings and an elegant Monterey Bay experience. 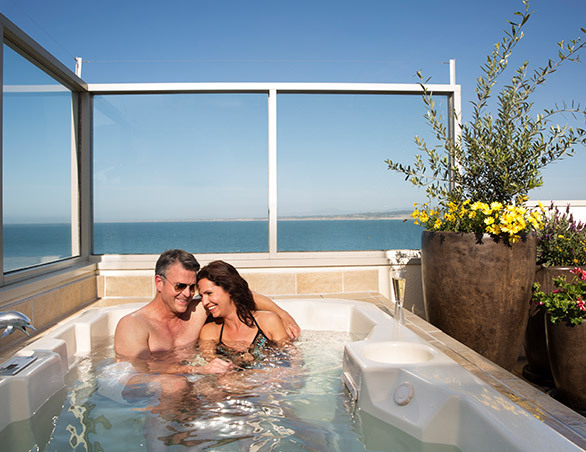 Step outside and savor the 500 sq ft sun deck, complete with a custom-built whirlpool tub, deck furniture for four, outdoor stereo system and a 180-degree view of Monterey Bay. Relax and entertain in the opulent living room, featuring a fireplace, dining room table that seats 12, half bath and state-of-the-art entertainment center.